PHONE MODELS - The ideal phone holder for iPhone 8, 7, 6, 6s and other phone models similar in size and dimensions. 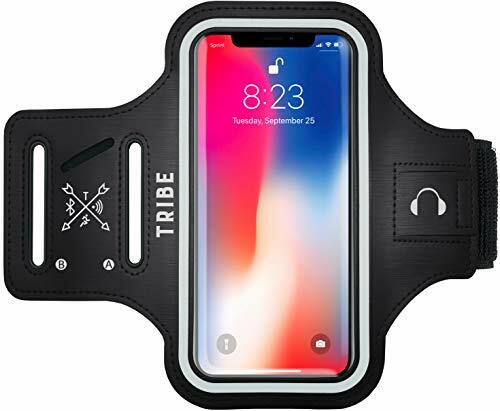 FULL TOUCHSCREEN FUNCTIONALITY - Our encased running armband acts as a workout phone holder while offering full protection and allowing easy access to your phone's touchscreen functionality and headphone jack. NO SLIP DESIGN - Unlike lower quality armbands, our premium running armbands are designed with the highest quality materials, including an extra-plush, adjustable elastic band to provide optimal comfort and fitment. Your phone is guaranteed to stay in place during the toughest workouts. PREMIUM GRADE QUALITY MATERIALS - Made from premium Polyurethane and a mixture of Lycra and Neoprene to provide optimal comfort, extra protection for your phone as well as water resistant capabilities. The ultra-plush, adjustable elastic band is designed to flex, twist and bend during your toughest workouts without losing shape. We designed the toughest armband to stand up to your toughest workouts! 100% SATISFACTION LIFETIME GUARANTEE - All of our products come with a 100% satisfaction guaranteed. If you are not completely satisfied with your purchase, we will refund you fully or send you a replacement free of charge! No questions asked! We are 100% dedicated to providing you outstanding customer service, your questions or concerns will always be addressed timely and to your satisfaction! That is our commitment to every single customer.